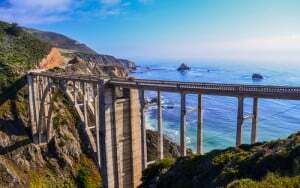 The Pacific Coast Highway starts in Olympia, Washington, and doesn’t end until L.A. With 1,700 miles between these two locations there’s a lot to see. Time is the most valuable commodity, especially when you’re on vacation, so how do you decide where to spend your time? Here is a list of some of the best stops along the West Coast. While Washington State is commonly known for gloomy weather and rain, Long Beach in Washington is a beautiful beach. The stigma of rain and clouds in Washington keep this beach less populated than those in California. Dunes lead into a long, sandy beach that has crashing waves and swaths of beach grass. The nearby town includes an assortment of bars, restaurants and gift shops. Further south, in Oregon, Cannon Beach stands as one of the nicest beaches on the West Coast. The large outcropping rocks that jut from the sand give this beach a lot of character and make sunsets something to remember. Enjoy long walks on the beach, body surfing on hot days, and horseback riding in the evening. Down in California, you’d be amiss if you didn’t stop in Santa Cruz. The beaches here are great for surfing, beach volleyball and people watching. With the added attraction of the amusement park boardwalk, there is never a lack of things to do. Ride the roller coaster, lounge in the sand on the beach, take a dip, then hit the bars for some nightlife as the sun sets over the Pacific. It’s important to remember that every state has different traffic regulations. You never want to bog down your road trip with traffic citations, so it’s a good idea to brush up on the traffic laws in the states you’ll be visiting. No trip down the Pacific Coast Highway would be complete without a visit to the Redwoods. The giant redwoods and sequoias form a fast canopy over trails that lead away from the main road. Make frequent stops while in the redwoods so you don’t miss out on any of the notable trees. Trees like the corkscrew tree, which has four different trunks swirling around each other, with room enough for humans to climb in and around, is quite a sight. General Sherman is toted as the largest living tree on the planet and is nearly 275 feet tall. But without frequent stops it’s easy to miss these astounding attractions as the road isn’t marked with signs. There are maps you can get at visitor information stations to help you navigate the Redwoods. If you’re a cyclist it’s important to note which trails are bike friendly and which aren’t. Breaking the rules can lead you into trouble with the park rangers. Food is a huge part of culture, and part of traveling is exploring the culture of the places you visit. 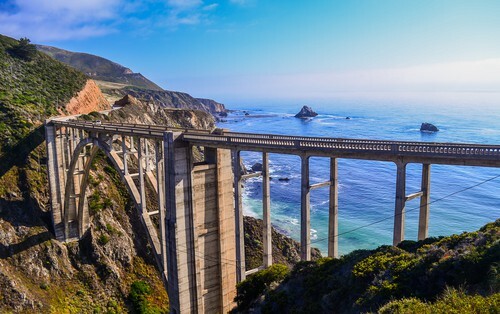 With the Pacific Ocean just an arms length away you’ll get some of the best seafood in the world while on this road trip. In Nahcotta, Washington, check out Bailey’s Bakery and Cafe. This spot may be tiny, but it is filled with food overflowing with big flavor. From sandwiches accented with olives and roast peppers, to homemade soup, and exquisite cinnamon rolls, Bailey’s might not be the seafood you were expecting, but is nonetheless worth a stop. The Original Mo’s in Newport, Oregon, has that seafood chowder so famous to the Northwest. Through its 65-year history, Mo’s has expanded with six different locations along the Oregon coast, but don’t let that deter you. Mo’s still has some of the best seafood you’re going to find on this trip. Malibu, California, plays host to Paradise Cove. The cafe is known for great breakfasts that are a little out of the ordinary, like its carrot cake waffles. This quaint shop has been a local favorite for decades, so if you want to taste what the locals prefer, this is the place for you.